Thanks to Hypnobabies Instructor Miranda Richardson for sharing this story with us. 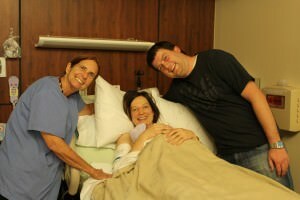 “When I became pregnant with my second child, I knew I wanted a different birthing experience. With my first birth, I had an epidural, Pitocin, “purple pushing,” an episiotomy, and a fourth degree tear. It was a painful recovery, and I knew I wanted to do things differently the next time around. My husband and I took the Hypnobabies class when I was about 5 months pregnant, so I had lots of time to practice the hypnosis techniques and listen to the wonderful audio tracks. The day before I gave birth to Samson, I was feeling antsy. I was still a few days shy of 40 weeks. My doula Miranda had told me walking upstairs while skipping every other step can get things going. So I thought, why not? I walked up the stairs a lot that day. I also listened to a fear clearing track [very important Hypnobabies hypnosis session to release fears and concerns about childbirth]. I told Samson (silently) that it was safe for him to come and that I was ready for him. The next day, I got up as usual. I got my son ready for preschool and dropped him off. When I got home, I started having some waves. I didn’t think much of it because I had been having “crampy” waves for over a week. I starting timing them, but they weren’t consistent at all. I decided to take it easy. A maintenance guy came by to look at a leaky pipe in our basement. I had a few more waves while he was there. As soon as he left, I decided to sit on my birth ball and listen to my Hypnobabies birth day affirmations track. I still didn’t really think this was “it,” but something felt a little different. Then my waves started getting stronger. I found sitting up positions to be much more comfortable (especially the toilet!). Around 11, I decided to call my husband and let him know this “might” be it. Thirty minutes later, I become convinced this was it! I asked him to pick up our son from preschool and come home. Then I called my doula and told her I would let her know when to come over. I tried to lay down, but a pretty powerful wave came, and I literally rolled off the couch onto my knees and leaned over the couch until it passed. I decided to go sit on the toilet because it felt comfortable. I turned on my “Easy First Stage” track [Hypnobabies track that keeps you in hypnosis and comfortable]. I had some more waves…and then some bloody show! I got excited. I texted my doula and told her to come over. My husband and son got home a few minutes later, and my husband started making childcare arrangements for our son. Miranda (my doula) showed up and came into the bathroom. She put her hand on my shoulder and said “relax.” I instantly felt calm and safe from head to toe. This was happening, and I knew I could do it! At this point I was not talking during my waves. My husband left to take our son to a friend’s house. Meanwhile, my waves were coming pretty close together, 2-3 minutes apart. I told Miranda I wanted to go to the hospital when my husband got back. I wanted to move to the birth ball. I had a wave as soon as I stood up. I knelt over the tub and Miranda rubbed my back and reminded me to use my hypno-anesthesia [Hypnobabies deep hypnosis comfort technique]. I made it to the birth ball and had some more waves. We got to the hospital around 2. We sat in the car through a couple waves, and then we started walking inside. I had two waves on the way inside, so I “slow danced” with my husband through each one. It really helped to be vocal. I found myself humming deeply through each wave, especially as they became stronger. This also helped me to keep breathing! Once we were inside, the nice receptionist got me a wheelchair. I sat down, closed my eyes, pictured my “bubble of peace” [Hypnobabies technique for emotional protection and confidence], and shut out everything else. We rode the elevator to the labor and delivery floor. They wheeled us right into a room. My husband and doula worked on getting the room set up. I got on the bed on my hands and knees through a couple waves. Then I had to lay on my back so the nurse could monitor our baby and take vitals. That wasn’t very comfortable, but I used my Hypnobabies hypnosis techniques until they were done. The baby sounded great and was moving around like crazy! As soon as they were done, I got back on my hands and knees, then moved to the birth ball. I sat on the birth ball and leaned over the pillows so I could be fully supported. They told me my midwife was on her way and would do a vaginal check when she got there. The waves were pretty powerful at this point and were coming about 2 minutes apart. My husband recited my hypnosis scripts to me and rubbed my back. Miranda did the Hypnobabies “hand on the shoulder” hypnosis cue and reminded me to “relax,” “let it go,” and “just let it happen.” Those phrases really helped me relax and trust my body. I sat on the edge of the bed, let a wave pass, and practically sprinted to the bathroom! The tub was about halfway full. I laid on my side and my nurse gave me a bunch of towels for support. My husband sat on a stool, held my hand, and told me to trust my body, stay in center [Hypnobabies cue for deep hypnosis with complete mobility], and let it happen. Almost immediately the waves felt different. I had the uncontrollable urge to push. My body was pushing involuntarily! It helped and felt good to push along with the waves. I began making low guttural noises, which felt really good. I could feel my baby moving down and felt lots of pressure around my bottom. My husband kept telling me to listen to my body and do what feels right. Miranda turned on the Hypnobabies “Pushing Baby Out” track. I honestly couldn’t even hear it except in between my waves because of the noises I was making! But I was excited because I knew I would be meeting our baby soon. And then…I felt him crowning! I think this is when my water broke, but I never felt it break, so I don’t know for sure. My midwife came in to assist. I started pushing with more gusto during my waves. I reached down and felt his head. It felt soft. Then I rested until the next wave…at which point I pushed some more and out he came! I felt instant relief. 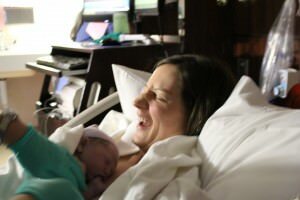 My midwife said, “get ready to meet your baby!” I opened my eyes and pulled him to my chest. He was absolutely beautiful. His back was covered in thick vernix. They suctioned his mouth and he sputtered a little. I was feeling so many emotions – love, surprise, excitement, ecstasy! I had him at 3:13 p.m. I only pushed for 20 minutes.